A small independent label, Stardust was run by Martin Murray, who had achieved fame as a founder-member of The Honeycombs. 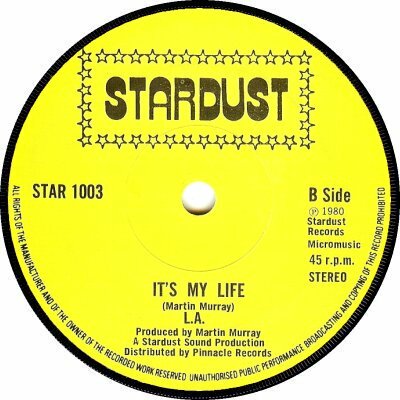 Stardust issued at least two singles in 1979, using different numerical series. 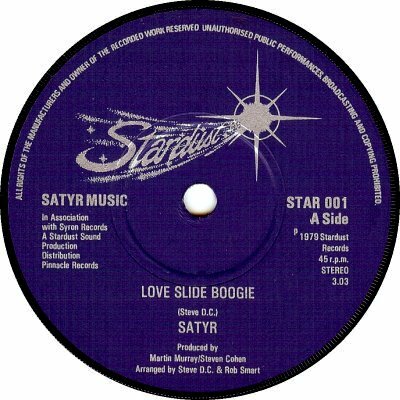 Satyr's 'Love Slide Boogie' b/w 'Problem In The City', was numbered STAR-001, while 'I Saw Her With Another Guy', by Mod band The Nightriders, from Ely, had a catalogue number of STR-1001. There were at least two other releases on Stardust in 1980; these kept the 1000 numbering but had a STAR prefix (2). Distribution was by Pinnacle. 'Thanks to Robert Bowes for the scans, and to Steve of the Low down kids site for the information.